Boulder&apos;s history is easily experienced. From its aesthetically-appealing historic downtown and neighborhoods, historic walking and bus tours, to its own National Historic Landmark, this college town of 103,000 residents is a history-lover&apos;s dream town. 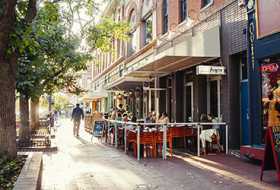 Stay: Overnight at one of Boulder&apos;s downtown historic properties — the Hotel Boulderado, the Bradley Boulder Inn, or the Briar Rose B&B. 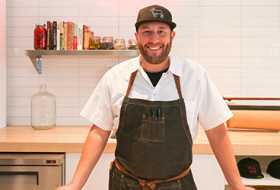 Eat: Many of Boulder&apos;s favorite restaurants are located in historic downtown Boulder. Play: Little kids cool-off by playing in the pop-jet fountains located on the pedestrian mall in front of the art deco Boulder County Courthouse. 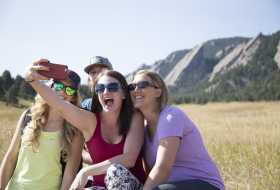 Listen: Take a tour from Banjo Billy Bus Tours and listen to guides tell stories about Boulder&apos;s historic people and places. See: Historical signs with words and photographs displayed along the Pearl Street Mall. 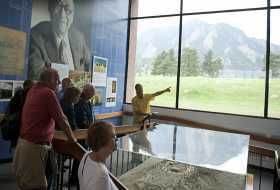 Learn: The Museum of Boulder at the Tebo Center is the place to hear all about Boulder&apos;s past. Stay: Overnight in a historic cottage (studios to three-bedrooms). Eat: Linger on the wrap-around porch of the restaurant, circa 1898. Play: Throw a ball, run around or take a nap under the big old trees in Chautauqua Park. Listen: Attend a concert — symphonic or rock n&apos; roll — in the historic auditorium. See: Stroll through the streets, gardens and hiking trails. Learn: Dial 303-952-1600 for a mobile phone audio tour. Boulder was first populated by miners who flocked to the area when gold was discovered in Boulder Canyon. The city&apos;s beginnings date to 1859 when a group of foresighted settlers organized the Boulder City Town Company. In the early years, the town grew slowly, because lots were expensive and business was limited to trades which supplied the mining towns in the mountains. In 1873, railroads connected Boulder to other major areas. Between 1873 and 1880, the population tripled. The young community of Boulder began preserving land in 1898 with the purchase of Chautauqua Park. By the end of the 19th century, Boulder had already established itself as a center for health, recreation, and culture. 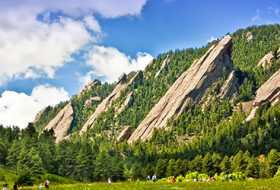 In 1967, Boulder became the first city in the US to tax itself for the acquisition, management, and maintenance of open space. Today, there are 45,000 acres of this open space surrounding the city.